Warm water therapies have proven effective throughout the centuries. Greeks enjoyed mineral and thermal water baths as early as 500BC. The ancient Romans were so convinced of the therapeutic value of thermal water that for 600 years their medical treatments were almost exclusively centered on the Baths. Spas and bathhouses have long been popular in Egypt, Finland, Germany, Spain and Turkey. Massage works to relax muscles and relieve pressure on nerves. It also boosts circulation and accelerates the body’s natural healing process. It’s used to promote relaxation, release accumulated stress, and gently stretch connective tissues. Hydro-therapeutic massage is delivered in a hot tub through an intricate and powerful system of jets and jet formations. Hot tubs today are used to alleviate stress and aid sleep. The jet-driven force of water enhances circulation, digestion and skin tone. Medical studies indicate that hot tub therapy may also be helpful in treating heart disease, arthritis, diabetes, lower back pain and sleep disorders. Spa and hot tub water therapies are highly valued for their relaxing, rejuvenating, and naturally rehabilitative qualities, and hot tubs remain a favourite social setting. All over the world, people are tapping into the healing beneﬁts of water in more ways than ever before. Did you know that relaxing in a hot tub can help help your body achieve a deeper sleep? According to research the number of healthy people suffering with sleepless nights is on the rise. Sleep researchers believe that many cases of insomnia can be traced to hectic, stressful lifestyles. The results of sleep deprivation are varied and can include battered nerves, grogginess, lapses in memory, depression, and even erratic mood swings. 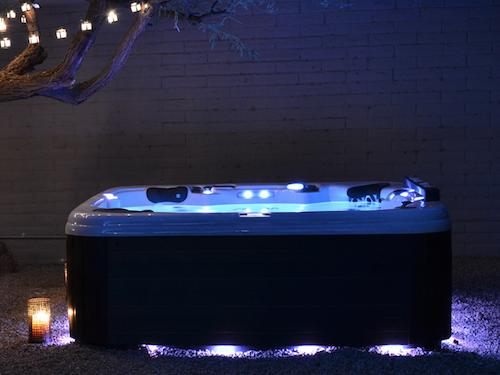 Studies suggest that soaking in hot tub just before bed time can ease the transition in to a deeper, more restful sleep. This may be due to a temperature shift, since the body’s core internal thermostat drops after leaving the water, which signals the body that it’s time to sleep. Or alternatively, the sleep improvement may be related to hot water’s relaxing properties – the buoyancy of water reduces body weight by approximately 90%, relieving pressure on joints and muscles, creating the sensation of weightlessness. The hot swirling water leaves you feeling both mentally and emotionally relaxed. In addition, hot tub-induced sleep is a natural remedy, unlike alternative sleeping aids such as prescription drugs, over-the- counter remedies and alcohol-all of which can make you feel groggy and have adverse side effects. The link between stress and illness should be of interest to anyone concerned with their health. We all have stress in our daily lives relating to work, family and society. Mental tensions, frustrations and insecurity are among the most damaging types of stress. Affected by stress, the heart works harder, breathing becomes more rapid and shallow, and digestion slows. Nearly every process of the body is degraded. Researchers have estimated that 80% of disease is stress related. Since we usually can’t avoid it, the key to dealing with stress is relieving it. A soothing and relaxing soak in a hot tub can help counteract the causes of stress and its effects on the human body. It is the perfect antidote to a hectic and stressful lifestyle. Recent studies give new hope to the thousands who suffer from diabetes. 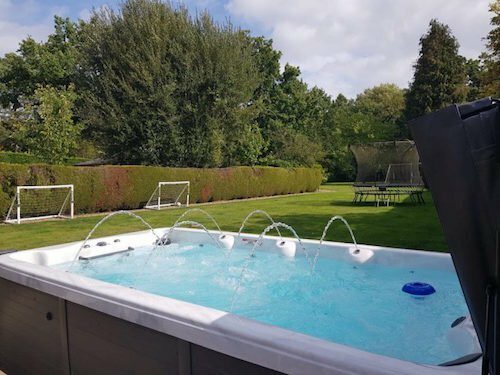 It simply stated that hot tub therapy “helped a group of Type 2 diabetics reduce their blood sugar levels and improve their sleep patterns”. The group of Type 2 diabetes patients were studied for three weeks. The patients were required to soak in a hot tub for thirty minutes a day, six days a week, for the duration of the study. The results were astounding! The patients’ average blood sugar levels were reduced by an average of 13%, and one of the subjects was able to reduce his daily dose of insulin by 18% after only ten days of the study. In reference to these ﬁndings, it would seem that hot tubs are especially helpful for patients who are unable to exercise. Ask any one who owns one and they will tell you that they feel better after using their hot tub. And there’s always been anecdotal evidence that the hot water and jets of a spa relieve backpain. A study published in the British Journal of Rheumatology offered evidence that hot tub therapy has both short- and long- term beneﬁts for people with lower back pain. A further study, by a group of researchers in France, showed that after three weeks of consistent hot tub therapy, examinations showed more improvement in the health status (as measured in pain duration and intensity and back ﬂexibility) of the spa treatment group than of the medication-only group. After six months, signiﬁcant improvement continued in the spa therapy group. In addition, their use of analgesics and anti-inﬂammatory drugs had decreased. Both professional and ‘weekend’ athletes can use their hot tubs to aid in repairing sore muscles and injuries. Neck and back pain, sports injuries, muscle pulls, spasms and soreness are often eased simply by a quick dip in your hot tub. Your hot tub can also be used as preventive medicine. When you immerse yourself in the hot water of a whirlpool, the temperature of your skin and muscles rise, causing blood vessels to dilate and thus increasing blood ﬂow to the skin and muscles. Turn on the jets and the pulsating water massages the skin, increasing blood ﬂow even more. The result? Your skin and muscles loosen and relax from the increased blood circulation. Before you exercise soaking in a hot tub relaxes your body and loosens muscles, making exercise easier and reducing the risk of injury. After exercising, soaking in a hot tub is a great way to wind down and relax your muscles. The hot’s swirling water embraces you… massaging your neck, shoulders, arms, back, thighs, calves and feet. But most importantly, hot tub use after you exercise will greatly reduce or even eliminate the stiffness typically felt the next day. Then there’s those times where you just want to shut the entire world off. Imagine escaping to your garden at night, by yourself and just soaking the stress away, while you stare up at the stars. We promise, you’ve never experienced anything like it. Numerous independent studies have proven that a warm water massage stimulates the release of endorphins-the body’s natural ‘feel good’ chemical. 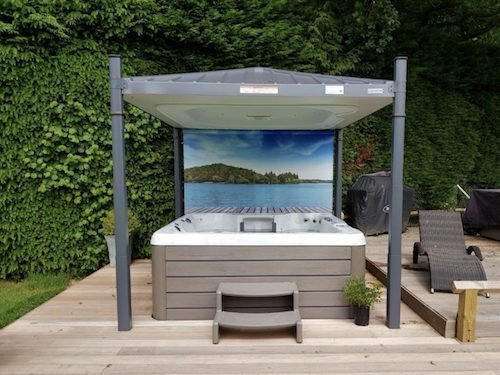 Your hot tub will enhance your sense of wellbeing, and leave you feeling fresh, clean and ready to tackle life’s daily challenges.